Philosopher; lived at Kairwan in the tenth century; younger contemporary of Saadia. At Jacob's request Sherira Gaon wrote a treatise entitled "Iggeret," on the redaction of the Mishnah. 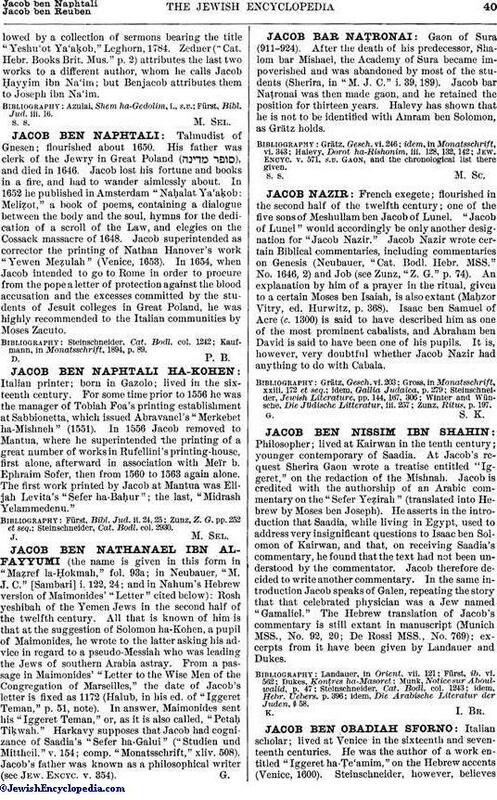 Jacob is credited with the authorship of an Arabic commentary on the "Sefer Yeẓirah" (translated into Hebrew by Moses ben Joseph). He asserts in the introduction that Saadia, while living in Egypt, used to address very insignificant questions to Isaac ben Solomon of Kairwan, and that, on receiving Saadia's commentary, he found that the text had not been understood by the commentator. Jacob therefore decided to write another commentary. In the same introduction Jacob speaks of Galen, repeating the story that that celebrated physician was a Jew named "Gamaliel." The Hebrew translation of Jacob's commentary is still extant in manuscript (Munich MSS., No. 92, 20; De Rossi MSS., No. 769); excerpts from it have been given by Landauer and Dukes. idem, Die Arabische Literatur der Juden, § 58.